No, really, I’m good at this,” I tell my husband Tom, pushing in front of him to stick out my thumb. 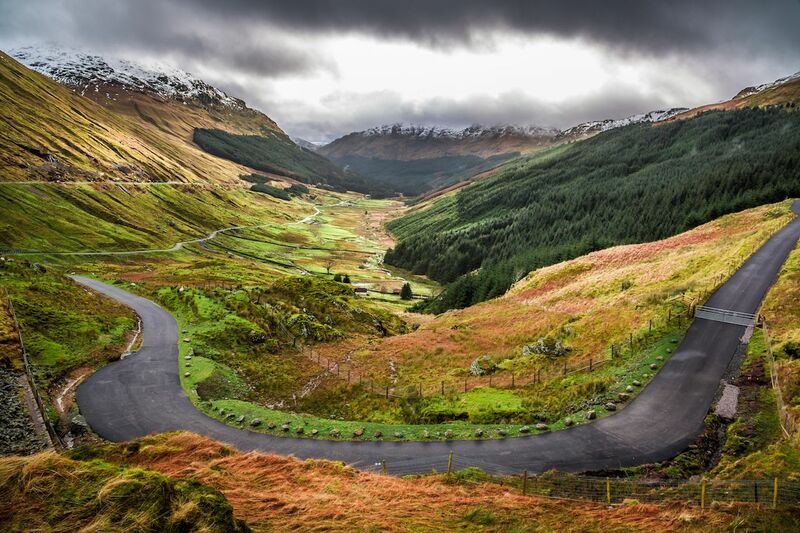 The cars rush past on the busy A82, a narrow highway winding through the Scottish Highlands. We are on day six of our 95-mile West Highland Way hike, and we have just walked from Kinlochleven to the Glencoe Valley in the rain. The inn I booked is in the Glencoe Village, about 10 miles down the road. As we hike down the misty path, the bus pulls away, and there won’t be another for hours. Hitchhiking is our only option. “And then what?” I say, waving my thumb at passing cars. Tom tells him we can carry them on our laps, and I climb in the back seat. Tom opens the driver’s side of the door, and we laugh, remembering everything is opposite in Scotland. We settle into the car, and we’re off. I’m happy I’ll be at our inn soon. I’m wet and cold, and I have to pee. I look around the car. Spilled food splashes the upholstery, and a few sweaters, hats, and an umbrella are scattered about. A plastic bag of something else is on the seat next to me, but I don’t dare sneak a peek. The bundle is about the size of a baby. Our driver tells us the Scottish always pick up hitchhikers, that they are the friendliest people in the world. We smile and agree. Thank you, we say. I look out the window and think about my hot shower and glass of wine at the inn. “That one there?” Tom asks, pointing to a giant roundish mountain with a scoured and craggy top and a skirt of green grass. “Aye,” the driver nods. It seems like he jerks the wheel a bit, but perhaps he’s just excited about James Bond. We pull over and Tom gets out for a photo. I sit in the back with my pack on my lap, and for a second, I think if we take off without Tom, I’ll be alone in the car with a stranger. I tell myself not to worry — my usual mantra. Even after hiking 19 miles, I could easily outrun this man. I’m a bit chubby myself, but Hugh’s a bean bag in suspenders. Then I wonder how I’ll get back to Tom after I’ve jumped from the car and run. Tom gets back in, and the driver says, “Did you get a good one?” Tom looks at his phone and says he thinks so. Okie dokie. I’m shivering in my wet shirt, so I take out my puffy jacket and hat and put them on. Tom is Midwestern nice, so he keeps saying, “Wow, thank you so much. This is beautiful,” which is likely prolonging our tour. And Tom’s right — it is beautiful. The glacier-scraped volcanic cones jut bright green into the patchy blue sky. The sunlight through the clearing clouds makes the grass an electric green. But I’m freezing, and I’m wondering where we’re going. We have pulled over again, and Tom is outside taking a picture of the stream cutting below a glacial moraine. I smile and nod at him through the rearview mirror. He just means that this place is remote, right? Not that he’s holding us captive and we can’t call for help. I tell myself not to worry. And to enjoy this. That this is the joy of travelling. That the unexpected surprises are why I travel. Then I remember the plastic bag on the seat next to me. And I wonder what’s in it. I think about the things that would fit into that white bag. An axe? Some knives? A baby? “Oh yes, I’m Hugh. Hugh MacDonald,” he says. “Nice to meet you,” we all say. Hugh and Tom shake hands. Hugh keeps driving, pulling over to avoid oncoming traffic on the narrow road. We wind further into the valley, alongside the bubbling river. Scottish thistle pops purple against the green grass and gray sky. Patches of blue sky appear and vanish over the mountains. This is easily one of the most scenic places I have ever been. I try to enjoy this impromptu tour but have internal fights with myself, as usual. I scroll through the pictures. The snowy landscape looks like something out of a fantasyland. “These are amazing,” I tell him. There are also pictures of what look like reindeer, very close up. I wonder if they’re stock photos. We’re in a pull-out again, and Tom gets out and takes pictures of a stone bridge and the mountains beyond. “Oh yes,” I say because is there really another answer? Hugh tells us about the volcanoes, the glaciers, and the avalanche paths. Glacial fans spread at the base of the rocky mountains. I look at my watch. It’s now 3:00. I say, “But they might not be there until 4:00. We probably have a little time.” I sit back, feeling satisfied that at least I have a date in an hour. I talk myself into believing Chris and Susan will be there at the lodge. Won’t that be fun, I think. There are no dead babies. It’s a bag of carrots. I figure Hugh knows more about Scottish deer than I do, so Tom and I approach the fence where three deer graze. Tom throws carrots at the deer. The deer look startled, but then they begin sniffing the air. Tom throws more. “No, no, no,” Hugh says, struggling out of the car and waddling over. “Give me that!” Tom hands over what’s left in the bag. “They’ll smell it, and come to you,” Hugh explains. By then, a white Clydesdale across the field sees what’s happening and gallops toward us. The horse noses over the fence. We feed the horse carrots, and Hugh is not happy about this. “Don’t give them all to Duncan!” Hugh shouts. We have turned our attention to the wrong ungulates. “The horse is Duncan?” I ask. “Aye,” Hugh says and tries to take a carrot from the bag, but he can’t because of his extreme muscle tremors, which I am only now noticing. Parkinson’s, I wonder. Too much drink? I don’t know, but he can’t get the bag open, and Tom tries to help him, but by now, Hugh knows we don’t know what we’re doing when it comes to feeding the Scottish wildlife. The deer come closer though Duncan is hogging all the carrots. Hugh tries to take a carrot out of the bag but spills the rest out on the other side of the fence. I look around, wondering if there’s a place I can go behind a bush and pee. But Hugh says, “Oh well. Take some pictures.” And it’s clear I have missed my opportunity. Hugh seems disappointed in us. I wonder if he regrets picking us up. When cars come in the opposite direction, the one closest to a turn-out must back up. We have to do this many times, sometimes backing over the gravel right to the edge of the cliff. I think about Hugh’s tremors, how shaky he is maneuvering the car. 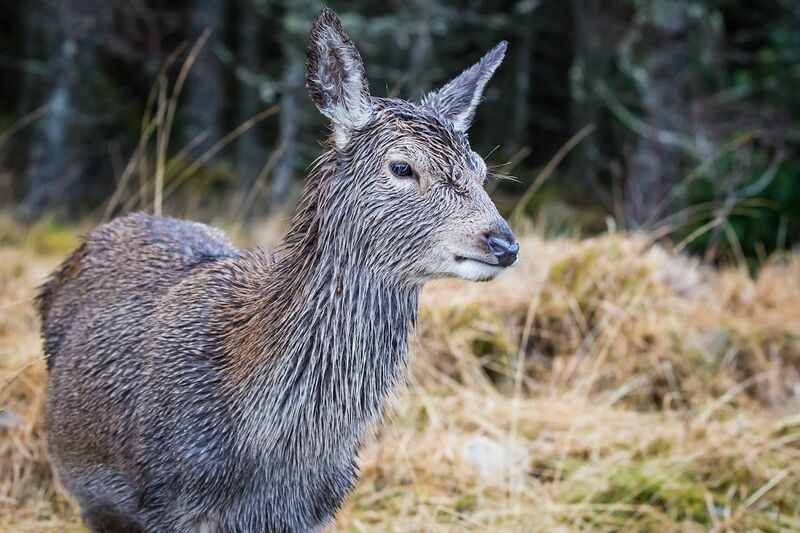 I sometimes can’t stop the stories in my head, and this is the story that comes to me: Hugh loves to feed the deer but because of his medical condition and how very dangerous driving has become, his wife had told him he could go feed the deer this last time. He had to go alone because having anyone else in the car would be too dangerous. She was at home in her Glasgow suburb, wondering if he would go over the cliff this time. And I was wondering the same. Then I notice the fawn. “A baby,” I say, pointing out the window before realizing that this will surely prolong our tour. Seeing that we are out of carrots, I wonder what Hugh will do. Tom holds out a mint, and the fawn approaches the car. Her spotted doe stands back, watching. We drive off again, and I see two more does emerge from the fern, but I don’t say a word. Hugh tells us he sends the photographs to his local paper and sometimes they print them. I tell him I got some good ones for him. “Deer are my favorite animal,” he says. I want to tell him that he shouldn’t feed them mints, that mints are worse even than biscuits, but I don’t say anything else. “I have to pee,” I say. “She has to use the toilet,” Tom says. And it’s 4:00, I think. Time to meet Susan and Chris! But it’s just pretend Susan and Chris. Real Susan and Chris are in their glamping pod, dealing with midges. “Just a waterfall and a view of the valley,” Hugh says. We drive through the valley, which is chock-full of camper vans, RVs, and hikers. I hope Hugh doesn’t have a twitch and run into an oncoming car. He pulls over again and instructs us to climb a metal fence, walk 100 meters, and take a picture of the waterfall. We do as we’re told. I tell Tom I really do have to use the bathroom. “Just one more stop,” Hugh says. After a while, we pull a u-turn into a small gravel parking place, and now we’re looking back up the U-shaped Glen Coe Valley. The mist drapes over the mountain tops, reflecting in the river. I get out to take one last photograph. Finally, we pull onto the A82 toward our inn. Hugh drops us off at our inn, we thank him, and I run inside to use the toilet. The drinks at the pub aren’t all that great, and neither is the food. Susan and Chris aren’t really there to tell us stories about their Scottish life, so we sit alone. We leave the pub and go to bed early. I scroll through my pictures, and the last one is the single most beautiful photograph of our three-week trip to Scotland. I think about Hugh, the very real possibility of his loneliness, and how he just wanted to share this with us — the landscape and feeding the deer, his very favorite thing.